Wow, what a crazy busy week this was! I tested and photographed 10 recipes for the cookbook, including the succotash recipe immortalized in the last video. The photo below is from the smothered pork chop recipe I did today, and I also had the video camera rolling, so stay tuned for that very delicious plate of pig soon. Have a great weekend! 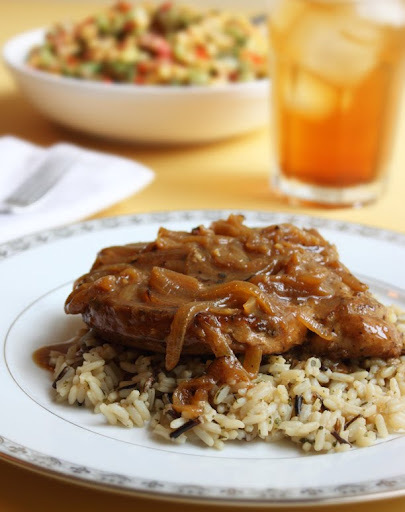 UPDATE: I just posted the written recipe for this Smothered Pork Chops Recipe on my American Foods site. Enjoy! Dang, wish I'd seen this sooner, Pork loin is whats for dinner tonight, and I've been blocking on what to do with it. That looks pretty yummy. Unfortunately, at this point I'm committed to another path. oh man! can't wait to see this tomorrow! Yum. I went out for dinner the other night and had my first ever free range pork loin chop. MY GOD! How delicious it was. Is the stuff I used to eat actually pork? I have to find myself some local free range pork to try this recipe when you post it. awww man i got pork just dying to be cooked in the fridge. cant wait for the recipe. Here you go... Just posted the written recipe on American Food http://americanfood.about.com/od/porkrecipes/r/Smothered_Pork_Chops.htm enjoy! Hey Chef John, could you please make Shoofly pie? It's always eluded me when I read the recipe from cookbooks, I know it should be easy, but mine just seems to collapse whenever I try to make it. Made this last week and my family couldn't stop smacking ther lips and licking their fingers!! Guess what we're having for dinner today again!!! Thanks Chef John!! YOU ROCK!! My chops are cooking right now... hoping you are right chef John that another 10 minutes will make them tender. I followed the directions explicitly... but did I hear you say in the video something about the chops almost cooked due to the brining? Were these chops brined before searing? I believe he said "browning".